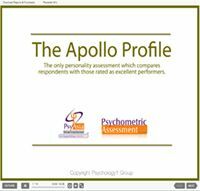 The Apollo Profile is a personality test that has been designed to be a multi-purpose instrument measuring personality, work preferences, motivations, and values. It is intended as a career assessment instrument, and for use in recruitment and selection, and the development of individuals and organisations. Building on established psychological theories and a model of excellence put forward in the Karpin report “Enterprising Nation”, the Apollo Profile is a comprehensive psychometric test. Designed from the outset to be used internationally, the profile is different to other personality assessments in that it compares test-takers to a model of excellence rather than to the average person. The Apollo Profile provides a personalised report that can give individuals, consultants and decision-makers insight into thirty-four factors that have been found to contribute to career success. Multiple psychological models and theories are incorporated into the test. In particular, The Apollo Profile provides diagnostic and descriptive comments regarding possible training needs and ways to enhance work and career performance. Developed by Psychometrician, Professor Richard Hicks & Management Consultant, Jim Bowden. The Apollo Profile compares candidates against a validated Model of Excellence. Measures 34 factors that are related to high performance at work. Data collected from various work categories. Categories include: senior executive, manager, sales personnel, call centre staff and entry level employees. Completed in around 35 minutes. Easy to understand reports comparing your candidate to those who are rated as excellent in their jobs. Comes with related applications such as Best Match™ mass-screening at an attractive price. The Apollo Profile is available in English, Thai, Korean and Traditional Chinese. The Apollo Profile provides a number of different reports, ranging from full narrative reports, to developmental reports and exception reports, to brief summary and feedback reports. GREEN Score is in the range normally associated with successful performance at the Level of report produced. Green generally represents an ideal score range associated with appropriate behaviours for that factor at that level, rather than an average or mean score for that factor. NOTE: Some factors have abutting green ranges, for example Achievement at an Executive level. This means that a very high score shows that the respondent highly values results, and is likely to push for them. However, just below this range, a respondent also values results, but is more likely to balance the need for achievement with other needs. Both these scores are associated with success, but usually sponsor different observable behaviours. Accordingly, different comments are given in the Narrative Report. AMBER Score is outside the range normally associated with successful performance at this level, and the candidate is likely to need some development. RED Score is outside the range normally associated with successful performance at this level, and the candidate is likely to need significant development. Comments made based upon scores in the red range should be verified and examined carefully from other sources if possible. Comprehensive The Apollo Profile is like a mini test battery that enables more information on specific attributes. Most other instruments measure far fewer attributes, with many common ones only having five or eight factors. Specialised Separate reports are available comparing against Executives, Sales Employees, Middle Management, Supervisors, Customer Service Staff, Support Staff and Call Centre Staff. Modern The Apollo Profile is based on today’s workplace and reflects modern organisational life. Readability Written in easy to understand non-psycho babble terms. Use of colour also aids quick benchmarking and relativities. Accurate Research and testing has been carried out in the design and construction of the Apollo Profile by psychologist Professor Richard Hicks; users can be confident of the methodology and data supplied, subject to the normal limitations applicable to the use of any instrument of this nature. Speed and Convenience Instant on-line processing of the questionnaire via the Internet gives you instant reports at your own location. Control and Security No other parties can access your confidential reports. Online and offline administration Apollo can be administered online or using traditional paper-and-pencil methodology, although most clients use online assessment nowadays. Facility to benchmark your own staff As a consultancy service, we can assist you in bench-marking your own staff and therein produce your organisation’s own model of excellence for future candidate comparisons. Best Match™ Produces limited reports initially whilst a quick click will hone in on a candidate of interest and provide a more detailed report for an additional credit. This means you save by only paying for detailed reports on those candidates of greatest interest. Note: Best Match™ fees are set for mass candidate screening. As a consultancy offering, we are able to work with your organisation to produce custom profiles based on what predicts success at your organisation. Once completed, you will be able to compare future applicants or current incumbents with the baseline of high performers. In order to use our Personality Assessments independently, you need to have a recognised certification in Personality Testing or the BPS Level 2 Personality Test User Qualification. For the Apollo Profile in particular, we also offer a one hour Apollo Module 1 Online Course. Successful completion of this course will accredit clients in using some aspects of Apollo. We also offer a distance learning full accreditation in Apollo. This is achieved by accessing learning materials at our Online Learning Centre, reading the materials and then completing an online assessment. Successful participants will then be fully accredited in the Apollo Profile. If you do not hold such qualifications, we can still assist by either giving you access to only text-based reports, or via our Psychologist-on-Call™ service wherein our psychologists will manage the process for you and then call you to explain all reports. If you don’t have a certification to demonstrate competence in the use of personality tests for work decisions, you may opt for the Apollo Narrative Report Bureau Service, or our Psychologist-on-Call™ service for psychologist-supported assessment and reporting.